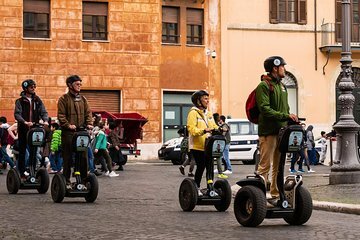 Er is zoveel te zien in Rome, het kan moeilijk zijn om in alle hoogtepunten te proppen, maar deze 2 uur durende Segway-tour zorgt ervoor dat je je tijd in de Eeuwige Stad kunt maximaliseren. Rit tussen iconische bezienswaardigheden zoals de Trevifontein, de Spaanse Trappen en het Colosseum; spring erop om Piazza Navona te verkennen; en glijden door de tuinen van Castel Sant'Angelo. Exceptionally fun way to tour Rome! Certain sites we re-visited after the tour for a more in-depth view, but as an introductory tour in a fun manner, it was great. Our guide, Santi, was excellent. He was knowledgeable, fun, and offered great suggestions about things to do in Rome. My 17 year old daughter accompanied me and I'm certain it is an event she will always remember. Highly recommend it. This tour was an excellent way to see a lot of Rome in little time! It highlighted places we may have wanted to go back and see. Our tour guide was brilliant and very knowledgeable! Awesome fun! Great way to see Rome in an afternoon. Our guide, Frederico was very knowledgeable and spoke very good conversational English. Saw some of the sights that we had already seen in our visit to Rome, but the insiders knowledge is invaluable. And the view from Villa Borghese is stunning. Segways are easy to drive, even our 16 year old daughter could do it. Wonderful way to see the city of Rome! Oleg our tour guide was wonderful - offered a ton of history, information and showed us sites that not all the tourists get to see. A super fun tour!